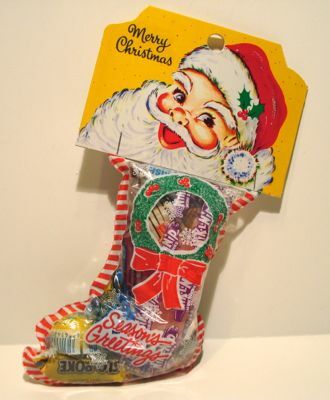 Christmas stocking filled with candy are a Christmas tradition. However you might be surprised to know that adults enjoy getting candy filled stockings as much as kids do. We have come up with a cute little stocking filled with retro and nostalgic candies that are perfect for kids, teens and adults. These are very popular for corporate events, holiday parties and even Santa has been known to give a few of these away. What is so special about these stockings you ask? Let me tell you. While they are only about 8 inches from the toe to the top of the header, they are chucked full of candy and cost less then $4.00. They are other stockings out there that cost less, but usually they have a few pieces of penny candy. We make up our stockings as the orders come in so the candy is always fresh and delicious. We have picked out a good selection of the oldies, but goodies for our stockings. What is really cool is that while the adults will remember eating these candies as kids, they will be new candies for the most part for today's youth. You will get 15 pieces of candy which do vary. Some of the candies are Frooties, Charms Sour Balls, Mary Jane, Slo Poke, Black Cow, Sweet Tarts, Smarties, Root Beer Barrels, Candy Sticks, Wax Bottles, Chick O Sticks, Razzles and the list goes on. I think the only thing what would make these Christmas stockings a little more old fashioned would be if we could get the cute little red mesh ones, however I think those are a thing of the past. So if you are looking to buy Christmas stockings for parties, or hand outs or gifts, these are perfect. You can buy just one or 101 whatever you need. Say Merry Christmas with a little piece of the past.